Pitti Palace: book your tickets now! Pitti Palace: enjoy your tour with a private guide! When visiting Palazzo Pitti, you can walk through the corridors and rooms used by the Grand Duke and the royal family. You will be able to perceive the fascinating atmosphere imagining what the life of the court should have been like. Visiting the Palace does not mean just visiting the art galleries that fill its rooms. The Palatine Gallery located inside the Pitti Palace is a magnificent collection of works of art, mostly belonging to the Medici family, consisting of portraits and paintings of Renaissance and 16th-century artists such as Pontormo, Raphael, Titian, Caravaggio, Rubens and many others. In the magnificent royal apartments, in addition to the exposed works, it is possible to admire the furniture and decorations used from 1500 to 1800 as the beautiful decorations created with a Florentine technique called "Commesso" which is a refined technique still used by the Factory of Hard Stone (Opificio delle pietre dure) in Florence. On the second floor of the Pitti Palace you will find the Gallery of Modern Art that contains works by artists, especially Italians, from the 1700 to 1900 period.  It is very representative the collection dedicated to the Macchiaioli that make up the route of the gallery, in addition to the paintings of Chirico, Morandi, Duprè, you can find works of the supporters of the Futurist movement and others. The rooms that now form the gallery used to house members of the Savoia family when they visited Florence. 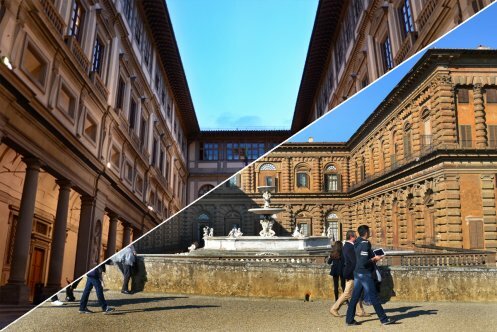 Completing the tour of the Pitti Palace we have the Museo degli Argenti (Silver Museum) and the Galleria del Costume (Costume Gallery) and the Boboli Gardens you can also access the Porcelain Museum located at the highest point in the Garden called "Casino del Cavaliere". The Palazzo Pitti, a magnificent example of Renaissance residence, is born of Luca Pitti's demand to surpass the Medici family palace in a magnificent way due to the rivalry between the two families. 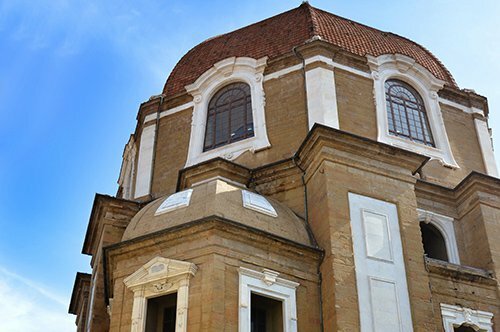 Luca Pitti was inspired by Brunelleschi's design filed by the Medici to create the project of a palace that would surpass that created by Michelozzo for the Medici family. It is said that the Pitti family asked that the windows of the palace be larger than the main door of the Medici palace and that the courtyard could contain the Palazzo Strozzi. 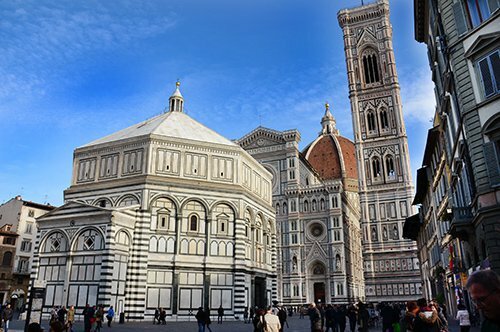 The architect who took over was Luca Fancelli, who built a large part of the building until, in the second half of the 1400s, the work was stopped because of the financial difficulties in which the Pitti family found themselves. In 1550 the palace became property of Eleonora da Toledo and Cosimo I de Medici which became their main residence. 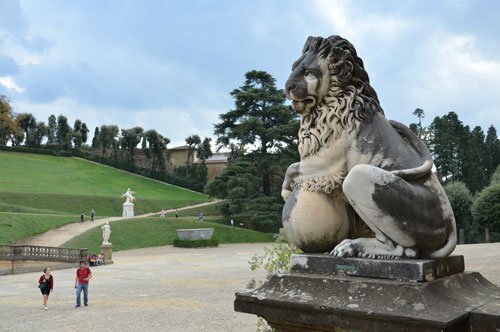 It was with the family of the Grand Duke of Tuscany that the palace was enlarged and finished, as well as the Boboli Gardens that reached its highest splendor, becoming one of the most beautiful examples of Italian garden. Later Pitti Palace received the Lorena families, was used by Napoleon as a residence and later became the residence of the King of Italy until 1871. Palazzo Pitti (Pitti Palace) has become a rich museum complex. 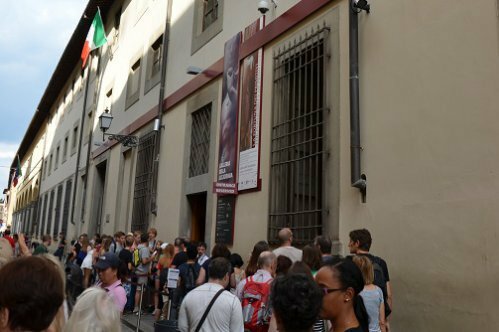 It houses the beautiful Palatine Gallery, where the paintings from the private collections of the Grand Dukes of Tuscany and the richest families of Florence are collected. 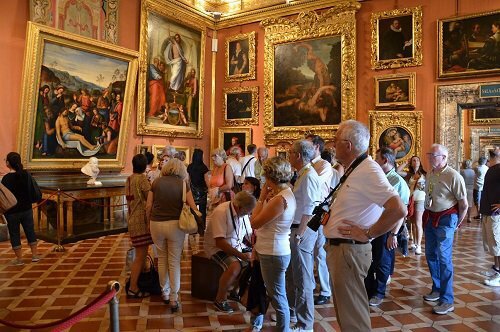 From the Palatine Gallery you can also access the tour that includes a visit to the Royal Apartments that once housed Ferdinando I de Medici, the Lorena family and the real ones of the Casa de Savoia. You can imagine the splendor and beauty of these environments that will transport you on a journey towards the history of life in the court. 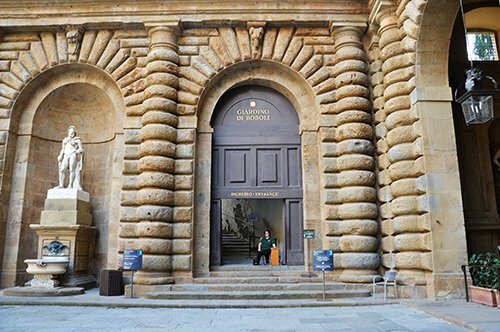 Another museum included in the tour inside the Palazzo Pitti is the Modern Art Gallery, where you will find Italian paintings and sculptures created between the 1700s and the 1900s. Did you know that in the stone façade of the palace, if you look carefully, the order of location of the second row of stones, starting from below, you will find a very long stone followed by a very short one that breaks the regular order of the design of the facade? It is said that Luca Pitti wanted to send a message comparing his greatness to the longest stone and that of the other families with the shortest one. Did you know that the Amphitheater in the Boboli Garden was created from the quarry that was used to extract the stone used in the construction of Palazzo Pitti and that, after the Second World War, was reopened to obtain material for the reconstruction of the neighborhood towers of Oltrarno? Did you know that the majestic Sala Bianca (White Room) inside the Palazzo Pitti was decorated by the will of the Lorena, who commissioned famous stucco makers, in the second half of 1700, to decorate the room with neoclassical decorations. The result was so surprising that the Grand Duke decided not to cover the stuccos with gold, but left them white as suggested by the stucco plasterers themselves. HOW TO VISIT THE PITTI PALACE? The Pitti Palace museum complex is made up of: the Palatine Gallery, the Royal Apartments, the Modern Art Gallery, the Silver Museum, the Costumes Gallery, the Boboli Gardens and the Porcelain Museum. 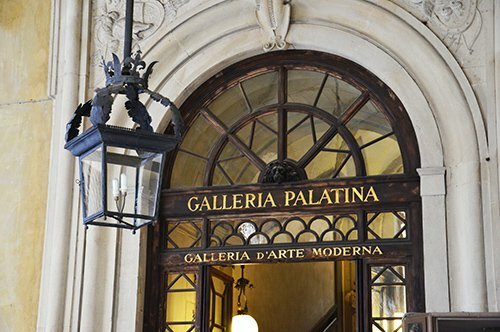 The entrance to the Palatine Gallery also includes the entrance to the Modern Art Gallery, the Treasury of the Grand Dukes, the Costumes Gallery and the Silver Museum; the entrance to the Boboli Gardens includes: the Porcelain Museum and the Bardini Garden. If you want to be guided by an experienced guide, you will have many options: if you love fashion, you can discover with a private guide the wonderful collections that are kept in the Museum of Fashion and Costumes of the Pitti Palace; if you are a fan of Dan Brown, you can visit the different Florentine stages of the book Inferno, among them the wonderful Boboli Gardens; if you want to delve into the history of Florence and the Medici family, you can participate in a guided tour of the Palatine Gallery. 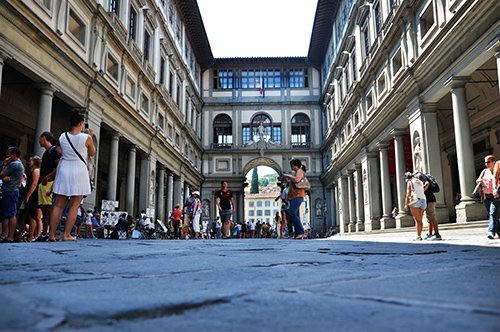 From March 2018, it will also be possible to buy tickets for the Uffizi Gallery combined with the Pitti Palace Pass, which includes priority entry to all the Pitti Palace museums, with a validity of 3 days. The Pitti Palace complex with the Palatine Gallery, the Modern Art Gallery and the Boboli Gardens is one of the most beautiful places to visit in Florence. 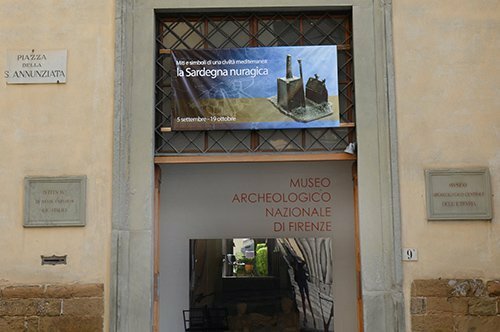 From Piazza Pitti you can cross the district of San Niccolò, visit the Bardini Museum and reach the foot of the ramps leading to Piazzale Michelangelo. 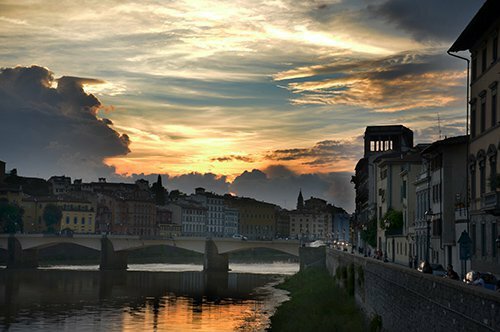 Going up to Piazzale will allow you to enjoy a privileged view of the city and admire one of the copies of Michelangelo's famous David. The original of this famous statue is located in the Accademia Gallery, another destination that attracts a large number of tourists every year, and very close by, is the San Marcos Square with the church and the San Marcos Museum in addition to the Archeological Museum. 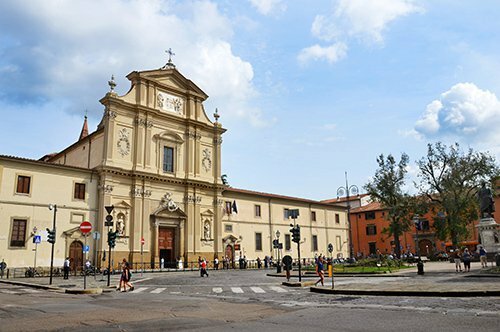 Returning to the center of Florence, you can walk through the representative district of the Medici family with the Church of San Lorenzo and the Medici Chapels that contain the funeral monuments of the members of this important dynasty. After San Lorenzo there are two other important squares that await you, the Piazza del Duomo with the impressive Duomo of Florence, the Battistero di San Giovanni (Baptistery of Saint John), the Giotto Tower and the Piazza della Signoria, the square with the Palazzo Vecchio, which still today is the seat of the municipality of the city of Florence. 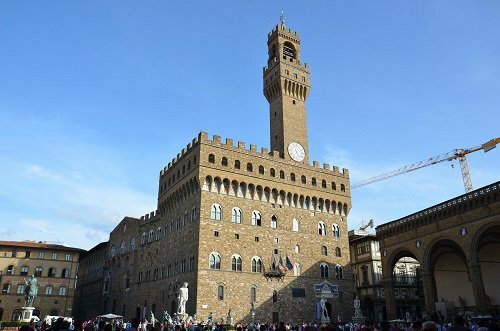 From the Palazzo Vecchio, the route of the famous Vasari Corridor begins, an elevated route that passes through the Uffizi Gallery, the Ponte Vecchio and the Boboli Gardens, joining the Palazzo Vecchio with the Pitti Palace. 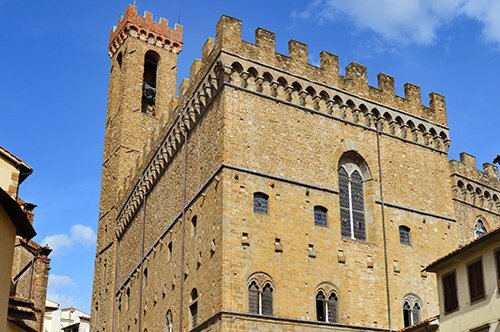 Just behind the Palazzo Vecchio is the Bargello Museum that will seduce you with its sculptures. 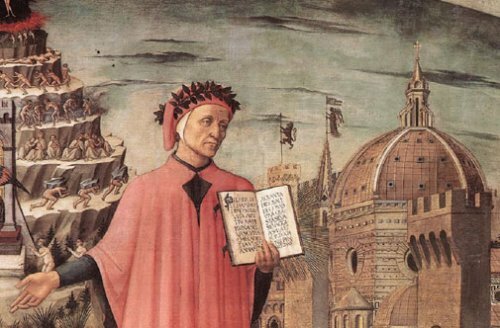 Many of the places mentioned before are the backdrop of Dan Brown's Inferno, if this book has impassioned you, take advantage of your visit to Florence to get to know these places in person following your Map of Florence. If Tuscany intrigues you, in addition to Florence you can organize a trip to the San Gimignano Towers, the beautiful town of Monteriggioni or Montalcino and visit other important cities such as Siena, Lucca, Arezzo or Pisa where you will see the Leaning Tower.